So within the first few minutes of meeting my boss, Tulia, on Monday, she explained how excited she was that Jenny had sent her an “economista,” or economist to start evaluating CEDAP’s work. I smiled, while my insides turned. Where did this idea that I am an economist come from? Sure, I majored in economics at Macalester College. I am very proud of what I accomplished there, but an economist is something entirely different. Where I have a BA, an economist has attained a Ph. D. Where I have an honors’ thesis peppered with methodological holes, an economist has an iron-solid dissertation. They also usually have a placement in some think tank or a professorship. Of course, I think this may stem from cultural differences in how we each define a profession. I am working in an office with several agronomists, a nurse, a surgeon, a professor of education, and a couple of engineers. Each has gone to school for a varying level of years to take on that profession and now identify as such, though their job responsibilities may not align with everything perceived of an agronomist, nurse, surgeon, professor, or engineer. For example, Tulia is an agronomist, but on staff she works in the focus area of governability and directs the technical team at CEDAP. This team includes directors for each type of focus area: governability, dynamization of economies, natural resources and environment, health, education, and communication and political incidence. As I learn more, I’ll make a point to touch on each of these areas to highlight the multifaceted and impressive approach CEDAP takes toward development. For now, let me just tell you that the numbers reveal a notable reach. 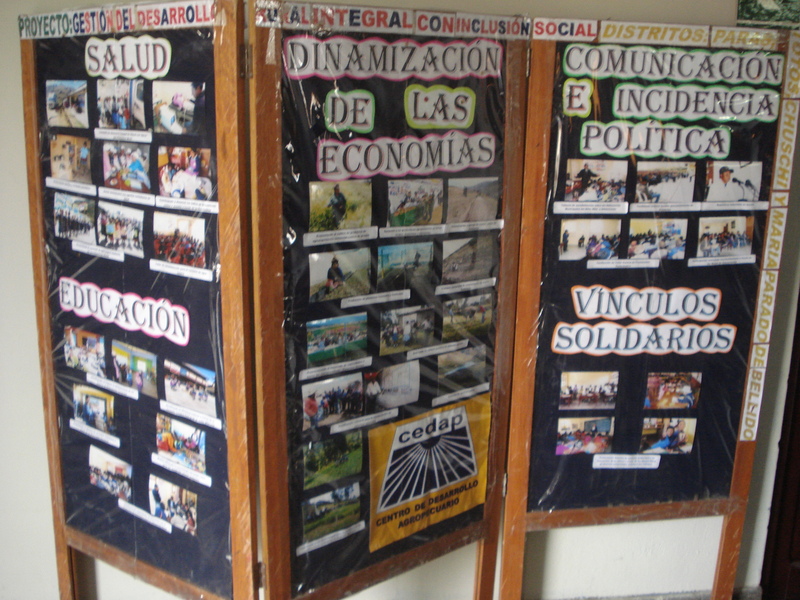 A display board of the many focus areas here at CEDAP. I’m still wrapping my head around each one. With that in mind, I feel a bit better about my labeling as an economist. Within the office, I expect that I have studied the most economics, so relatively speaking, I am the relative economist. I just call myself a volunteer and Tulia acknowledged that part of my role as well. Tulia also explained her hopes and dreams from what I would do this year. She wants an overall evaluation of the work CEDAP does to be reported to their donors and for application for future grants and support. While this includes qualitative evaluation, which they have done before, as she showed me, she is hoping I will also do an economic evaluation. I’m thinking we may run into another difference in understanding. To me, an economic evaluation is one that attempts to determine the causality between a specific program or intervention and the output. This is best accomplished through Randomized Control Trials (RCTs) within the area of intervention. Unfortunately, RCTs are highly planned methodologies, which should be input from the beginning. I haven’t heard anything about one yet, so I’m not hopeful they’ll drop that kind of data in my lap. Instead, I think Tulia perceives economic evaluation to be a look at how the economic lives of families have been changed by the interventions. Of course, that’s central, but my thoughts are a little more operationalized, perhaps impractically. Today, I finally get the opportunity to talk with Tulia and Alberto, the head of CEDAP. I am hoping to gain a little more insight into what type of evaluation they exactly want and let them know what ideas I have. I’m highly thankful for the opportunity, as I’ve spent the last two days mostly sitting in the office, taking advantage of the internet. It’s not that I think they don’t need me, I think it’s more that they are quite busy. It’s budget season and so everyone is planning for the upcoming year. Plus, they just finished some program intervention. In fact, I was the first in the office on Monday, and waited 45 minutes for Tulia to show up, as she was coming back from trip into one of the rural communities. Thankfully, the YAV program prepared me for this, but I was starting to worry as I sat in the office without being assigned any tasks. I read many of the materials on CEDAP provided me and also did my own review of “proper” impact evaluation methodologies, seeing most offered little insight on what to do after the fact. Still, I’m very excited. How could I not be? This is kind of what I was trained to do at Macalester. Plus, I’m finding a community at work as well. Tuesday morning, we had a half-hour snack break to joke over coffee, bread, and avocados. It was like organized water cooler gossip time. They were all shocked to learn I was only 22, but didn’t seem to let it affect their perception of what I will be able to do. Later, four of the guys in the office* invited me to play soccer with them tonight. I told them I’m no expert, but they said that’s no worry. Two said they used to play in school. My only advantage seems to be that the youngest is 33. One of these four, Marco Antonio, suggested that I treat this like a thesis, because it’s as much work as he’s seen those writing theses do in the past. He also encouraged me to take any data or findings with me, which I smiled at and said I’d only do with permission. He agreed, but I found it interesting that he suggested something that can easily come across as extractive. I’m not here for myself, but he said, that a Ph. D candidate from the US once said, that it’s always worth taking back data with you, because you never know when you’ll get more of it. I really appreciated the conversation and will consider whether this a respectful way to follow his suggestion. I’ll write more after the conversation with Tulia and Alberto about the specifics. I’m nervous for the conversation as it will need to be a slow, deliberate process to make sure everyone is understood. Hopefully, I’ve got what it takes. *I still have barely learned any names. I met 15 people the first day, more the next, and remembered probably 5 names? D’oh. Kyle, these entries are great! I look forward to reading more about your experiences. Your style reads well. Thanks Will. Style is always a concern, so I’m glad to hear I have your seal of approval!